The father of the Cubist movement and modern art. Presents objects only as they are conceived by the mind and how they exist, not the way they are seen. Represents the selected objects in the cubes as if they were crystals. Describes a dead nature by means of a defined monochrome by clear-darks, shades, etc. It does not use perspective. Primitive Cubism is considered to have had its birth in 1907 when the french writer Guillaume Apollonaire introduced Picasso to the French artist Georges Braque. Together, greatly inspired by the French postimpressionist artist Paul Cezanne they advanced Cubism rapidly. 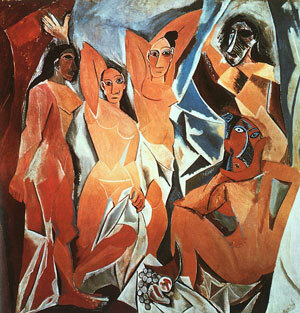 The same year Picasso completed Les Demoiselles d'Avignon which foretold the future development of Cubism. He had taken an approach different from Matisse and Derain on African and Iberian sculpture and culture. Picasso used it as a clue to part from traditional anatomical human physical structure, and derived a form which combined elements seen from many different angles. He then left the tradition of seizing natural objects from single angle under the laws of perspective, a tradition which had existed since the Renaissance. From 1909 -10 both Picasso and Braque advanced even further into the dismantling of objects and tried to depict the reality of an object without using the traditional laws of perspective and shading. This short period is what we may call Analytic Cubism and its peak was around 1911. The objects appeared to look very different from nature and Cubism started to act not from visual reality but from the reality of the concept. Because of this that Cubism is conceptual and the intellectual opposite of its predecessor, Fauvism. Braque and Picasso shocked the art circles. Their ideas spread rapidly and two artists, Gliezes and Metzinger (who belonged to the group of the first exhibitors of cubism.) wrote a book in 1912 on the new trend saying that Cubist paintings must be non-decorative and self-controlled and that cubism was the expression of an idea. Soon the founders then entered a new phase where the rich colors regained their richness and the objects became easier to recognize. Picasso began to experiment with papier colle and by pasting already printed paper on canvas. They there ended up at Synthetic Cubism. By 1913-14 most artists in Paris had turned to Cubism and it became the universal language of avant-garde painting. From there it spread over Europe and to New York. We can consider Cubism to be the general term for the art from 1907 to the 1920s. From there we have the ancestors or founders of modern art. Original name Pablo Ruiz Picasso. Spanish expatriate painter, sculptor, printmaker, ceramist and stage designer. Created more than 20 000 works of art. Blue Period :1900-04,- expressing human misery. Rose Period :1904-05,- more happy, inspired by the Circus and Paris. Realist and Surrealist :1914- with Word War I, made realist style portraits of wife and son and neoclassical pictures. At the same time he made peculiar portraits of small headed women and motives from mythology. Cubism with Eroticism: 1930- inspired by mistress Marie Therese Walter. 1937: Guernica- a portrayal of the horrors of war commissioned for the Spanish Pavilion at the Paris World's Fair..
With the arrival of W.W II in 1939-45,works with death as the subject. Late Works: Recapitulation was based on works by earlier masters. Devoted himself to an artistic production that contributed significantly to and paralleled the whole development of modern art in the 20th century.